1 tsp chaat masala3-4 tsp Panu Puri masala Add the Pani Puri masala to the watery Green ChutneyKeep the Puris in a Plate. Serve the chutneys, moong sprouts in wide mouthed bowls. Add the chaat masala to the potato and keep it in another bowl alongside the chutneys. 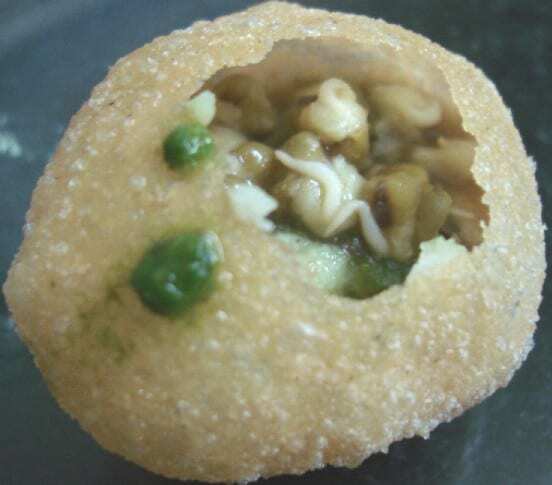 To eat:Make a small hole in the centre of each puri with the nail of your thumb. These puris arequite delicate so be careful while breaking them-you want the whole puri intact except a small hole. Add the xbcspoon moong beans , xbcspoon mashed potato to all the Puris. Now you get rewarded for your patience. Without thinking twice dip the first puri in the Green chutney(remember it is spicy) fill the puri as much as you want, then proceed to the DT chutney fill the puri and put it straight in your mouth-full puri. Repeat for other puris. Enjoy the spicy mouthwatering Pani Puris!Bliss personified!